My week-long visit started in Dublin after an amazingly short (5 hour, twenty minute) flight from Newark, NJ—thank you jet stream. Prime Tours President Dave Matthews, fellow Prime Tours Director John Coy and I arrived just past 7am local time which was 2am for us. Met by a cabbie arranged by the Irish Tourist Bureau, we loaded up and headed off into the dark, chilly, rainy morn. The purpose of my visit was to familiarize myself with the country and the venues we are selling in our tours. Both Dave and John are seasoned Ireland travelers. By the time we arrived at our hotel the sun was making a valiant attempt to prove dawn does indeed come to Ireland. We checked in, dropped off our gear and headed back out via our private cab to the Tourist Bureau’s offices. There we met two lovely ladies who had arranged our week for us. Esther and Katarina were German nationals who, because of the European Union’s open borders, had seamlessly migrated to Ireland to help promote tourism to the Emerald Isle. I learned in subsequent conversation that Ireland had seen a tremendous influx of young eastern Europeans during the boom ‘90’s. The economic bust that followed in 2002 sent many back to their respective countries but the diligent and hardworking remained and are working hard to turn the country’s economy around. Esther drew the short straw and would drive us through Dublin for a personal city tour. We spent the remainder of the day visiting the signature sites; Trinity College, St. Patrick’s, Christ Church, the Guinness Storehouse, Kilmeinham Gaol (jail), O’Connell Street and the General Post Office (sight of the 1916 Easter uprising) and Aviva Stadium—the newest sporting venue that replaced Landsdowne Road in 2010. Aviva will be the sight of the Navy/Notre Dame football game in September (Prime Tours, is offering a tour to Ireland around the game). By 4pm the Americans were beginning to feel the effect of jet lag. Esther picked up on our slowed speech and lagging energy and suggested we call it a day. We jumped at the opportunity to return to our hotel for a short nap as we had dinner reservations at 7p. Dinner would be at Taylor’s Three Rock, an iconic Irish pub and cabaret. We were picked up by none other than the owner of the dinner theater John Keenan, a big, boisterous Irishman who kept us enthralled with over-the-top stories on our 30 minute ride to the theater. 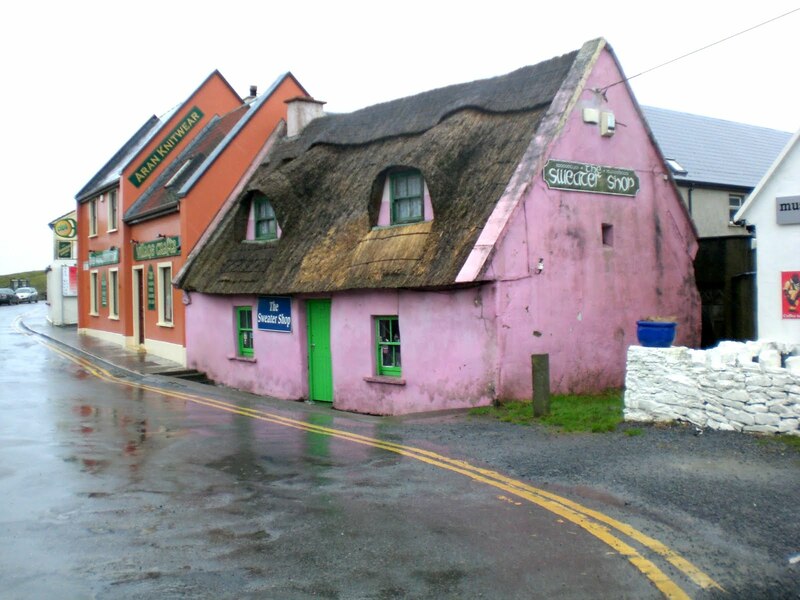 Taylor’s Three Rock is a rambling farmhouse bar with the largest thatched roof in Ireland soaring to over 50 feet. Nestled due south of the city in the rural foothills of the Dublin mountains, the theater can accommodate over 200 guests. The cabaret was dark this night as the theater takes a break during the off season. We were however feted with a sumptuous meal and regaled with more fanciful Irish stories from John. A showman at heart, he made sure we would include Taylor’s Three rock into any tour itinerary we sold. John returned us to our hotel well after 11pm and all three of us crashed hard—barely able to recall the whirlwind of our first day in country. The next morning started early as we were to meet the bus for a day long tour of the Wicklow Mountains National Park, 30 miles south of Dublin. Each of our hotel stays included the famous Full Irish Breakfast each morning and we took full advantage. Irish bacon, white sausage, blood sausage, potatoes, sautéed mushrooms, broiled tomatoes, baked beans and eggs. The only way to start your day! The bus pick-up was a fifteen minute walk away from our hotel. Being so far north and it being winter the sun had not begun to rise even at 8am. 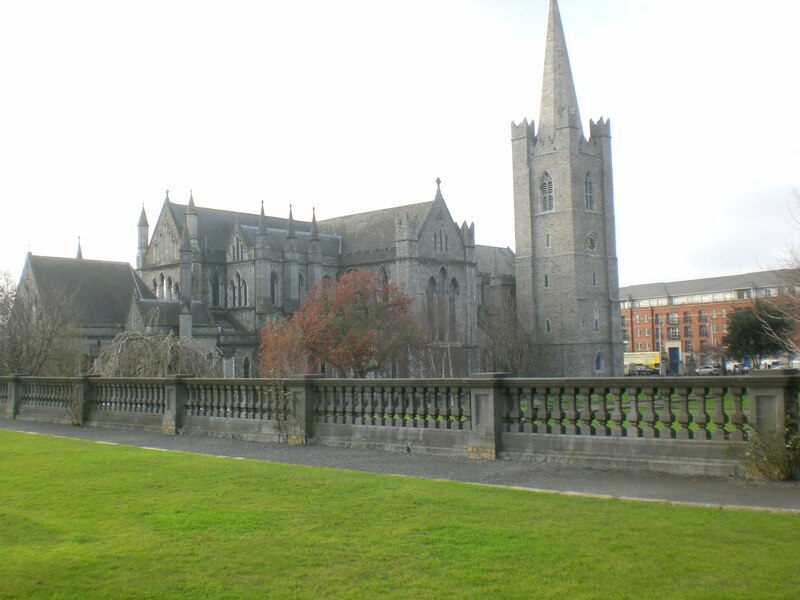 Our walk took us past St. Steven’s Green, Dublin’s largest public park. The 22-acre park used to be the outskirts of town. Until 1663 St. Stephen’s Green was a marshy common on the edge of Dublin, used for grazing. It’s hard to imagine the park once being the edge of town as it is just 8 blocks from the Liffy river and the center of today’s town. We met the bus to Wicklow and were offered the front seats by our driver/guide Steven. The gals at the Irish Tourist office had really set us up! The bus made several more stops around the city picking up the passengers for the days tour. Steven didn’t waste any time in pointing out every sight as we drove past. Once full, we headed south with Steven narrating along the way. The hour trip seemed half that as there was so much to see and hear. The sun was now up and along with it some blue sky! 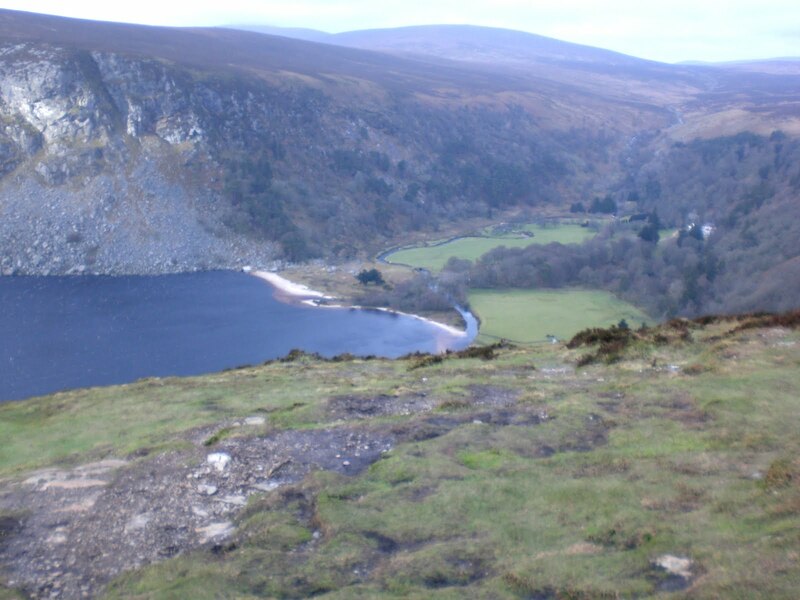 The Wicklow Mountains and surrounding valleys are some of the most scenic in Ireland. Broad expanses of highland bogs extend as far as the eye can see and the varied topography makes the area a must on any tour. The highlight of the trip is a visit to Glendalough—the Valley of the Two Lakes. It was here St. Kevin founded the monastery in the 6th century. The existing monastic ruins date from the 8th and 12th centuries. A cathedral, stone church, Celtic stone crosses and a 100 foot stone tower still stand. 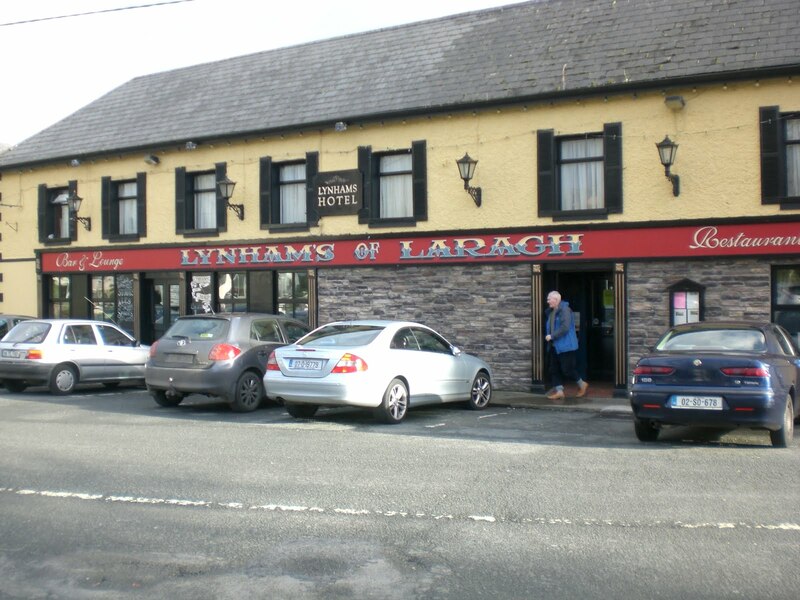 After a 3 kilometer walk along a scenic path to the two lakes, we returned to the bus for a short ride to lunch in Laragh, a tiny crossroads village of no more than a dozen buildings. Surprisingly, we had our choice of several places to eat and chose a traditional looking pub. Once inside it didn’t disappoint. Beamed ceilings, worn wooden floor, a smoke-stained fireplace complete with a blazing peat fire all made for the perfect Irish lunch spot. The warm fire was especially welcome because I think I failed to mention the temperature was hovering around 40° F. Coupled with the wind and occasional rain/mist, it made for a brisk outing. Oh yeah, the wind. Living in Florida I know wind—we get it all year-long and sometimes we get too much. But the wind blowing along the ridge on the road above the Two Lakes was ungodly. The Two Lakes are at the bottom of a very narrow valley. The channel between the two ridges forces the wind through a natural tunnel that accelerates a mild breeze into gale force winds. One of our bus mates was literally blown off her feet while we were out of the bus at a photo-op. I was able to lean into the wind at a near 45° angle and remain upright. It was awesome. After a hearty lunch of Irish stew, we re-boarded the bus for a trip to the coast. The Irish Sea separates the UK from Ireland. It’s joined by the Atlantic to the north and the Celtic Sea to the south—it is cold water. So it would be an amazing sight to see bathers swimming in such chilly waters in January, right? Amazing it was. As we approached the town of Wicklow, Steven teased us with stories of the hearty soles who bathe every day in the Irish Sea. At first I didn’t believe him and was sure he was full of Blarney when we saw a group of divers in full wetsuits entering the water at our first stop. Ha! Swimming in wetsuits is hardly bathing in 40° water. We were let out of the bus and urged to follow the path around the shoreline to a stone structure about 200 meters away. 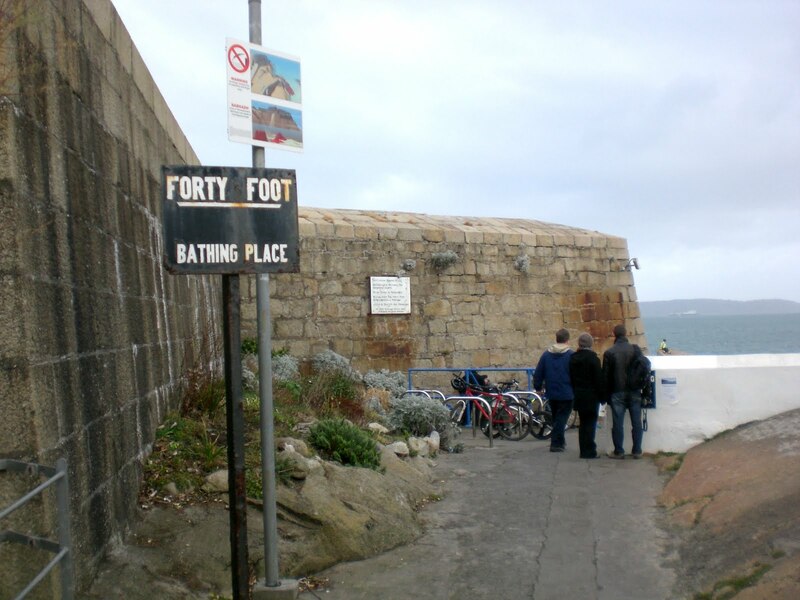 The Forty Foot was a point of land that jutted out into the sea. Marked by a simple sign, it was the swimming area Steven had boasted about. As soon as we crested the hill and were able to look over the stone wall leading to the Forty Foot we saw several people swimming well out in the water. I was impressed. 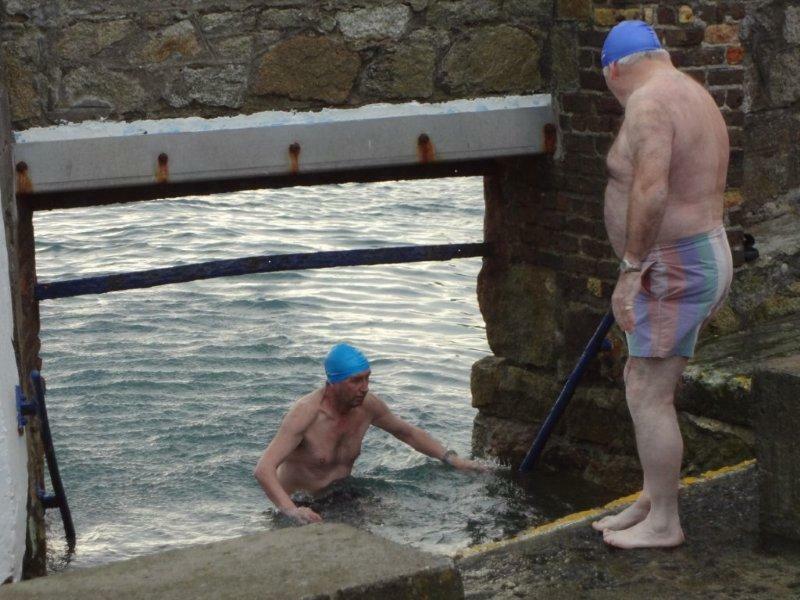 I stopped a chap who had just finished getting bundled back up after his swim and asked him about it. He nonchalantly admitted to swimming daily, regardless of the weather saying it was good for the heart…o.k. We finished our visit to the Wicklow area with Steven alerting us to having just scratched the surface of this amazing area. The “Garden of Ireland” has much to offer and begs for a return visit. We returned to Dublin in time to take in the National Archeology Museum. Steven’s talk during our trek through the bogs intrigued us to the amazing recent finds made by archeologists and he informed us of a current exhibition highlighting these finds. It seems the Vikings, who early on set upon the Emerald Isle, used the bogs as ceremonial burying grounds. The peat bogs’ chemical makeup served as a natural preservative. 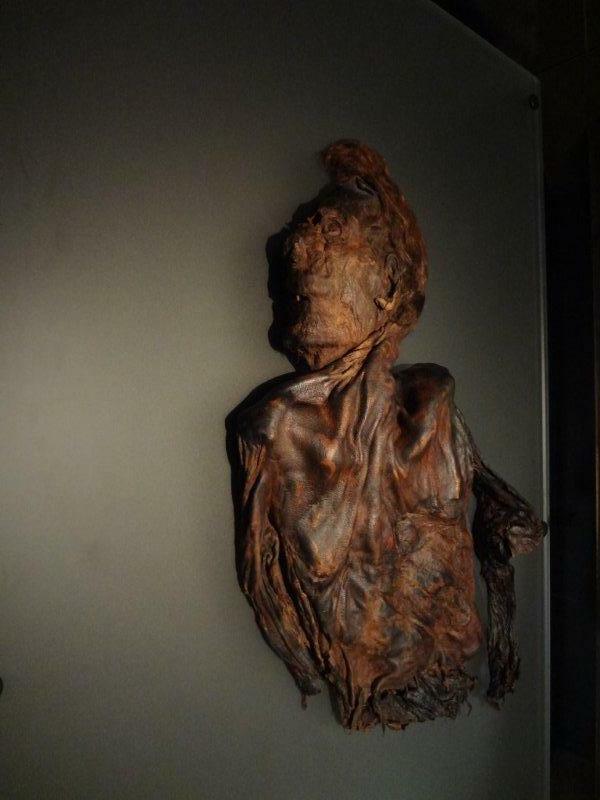 Clothing, wood and even bodies were preserved, mummy-like after thousands of years buried in the peat. The exhibition highlight were four Viking bodies in a remarkable mummified state. Several had most of their hair intact and their clothing was preserved almost like the day they died in it. The high iron content in the peat that had helped preserve them turned everything a burnt umber color but otherwise it was eerie to see the amount of detail in their lifeless bodies. Like most National Museums in Ireland, entrance is free. Time did not allow but we could have visited the National Library and the Heraldic Museum right next door. Tonight’s dinner would once again be at a traditional Irish dinner cabaret/pub. The Merry Ploughboy Pub however did have a program scheduled and we were anxious to enjoy dinner and the show. With an hour to kill before heading to dinner we walked to Trinity College and strolled through the main quad. Trinity College, formally known as the College of the Holy and Undivided Trinity of Queen Elizabeth near Dublin, was founded in 1592 by Queen Elizabeth I. Trinity is one of the seven ancient universities of Britain and Ireland and it is Ireland’s oldest university. It is also home to the Book of Kells. The Book of Kells is an illuminated manuscript, in Latin, containing the four Gospels of the New Testament together with various prefatory texts and tables. It was created by Celtic monks ca. 800 or slightly earlier. Sadly the building housing the manuscript was closed for the day. Another reason to visit again soon! We continued our walk for a few blocks in the direction of Temple Bar, a revived part of central Dublin now hosting artists, filmmakers, galleries and a multitude of trendy pubs and cafes. It’s were the cool people hang. 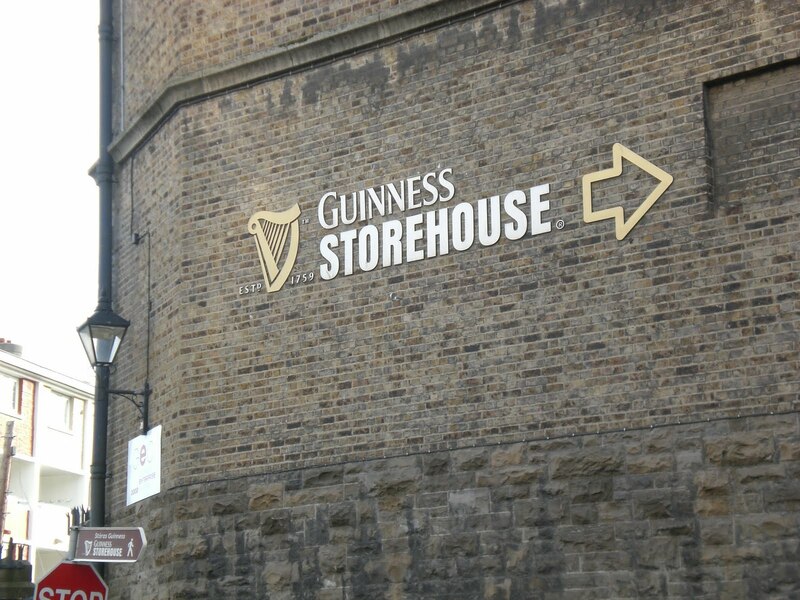 The restored buildings and cobblestone streets finished the effect of living 150 years ago in the heart of Dublin Town. 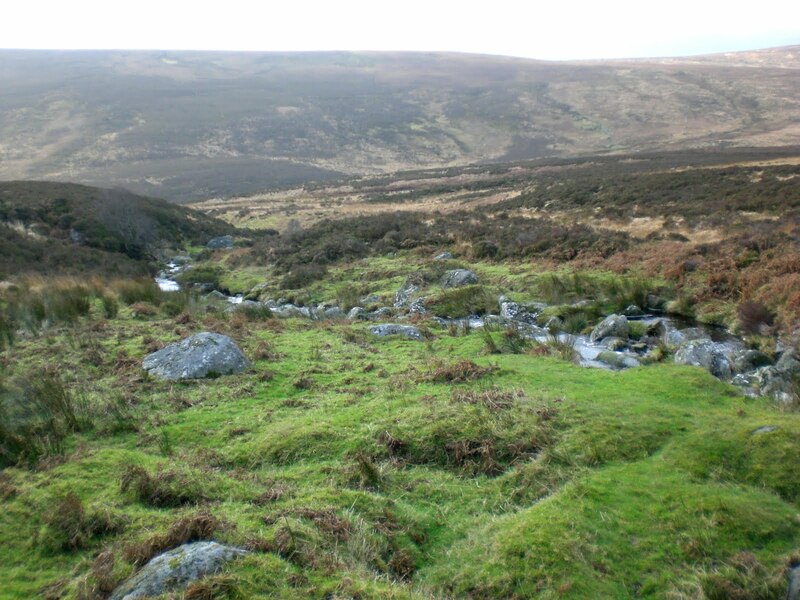 To make our 8pm dinner we hailed a cab and headed back out into the foothills of the Dublin Mountains south of town. It seems all the good Irish cabarets are in the outskirts of town. The building housing the Merry Ploughboys was very similar to Taylor’s Three Rock. An old two-story Irish farmhouse refurbished to serve 200 plus for dinner and a show. We arrived a bit late and were seated just as the band had started. Many in the crowd of over 150 this night had already begun to be served. We settled in, ordered from the fixed menu and took in the sights. Four long tables seating at least 50 each extended lengthwise from the stage. We were seated in a little cutout at our own table stage right of the four long tables. The table nearest us was full of what turned out to be a business group from France. The table next to them was a group from Norway. The remaining patrons were presumably a microcosm of the United Nations as we had seen a multitude of nationalities represented during our short stay. As we would come to find out, the European Union and common currency made travel between EU countries easy and hassle free. Our dinner was served and it was fabulous. I had the lamb shank and maybe it was because I was in Ireland but it was the best I had ever had. Heaping bowls of potatoes and steamed vegetables accompanied the main course which was preceded by one of the best seafood chowders I have ever had. Of course during it all the band is playing traditional Irish songs and they too are as amazing as the meal. The four musicians were truly virtuosos, especially the gent playing the uilleann pipes and the dude on the bodhran, the Irish drum. I had never heard the drum played so well. He could make it sound unlike anything I had ever heard. Truly amazing. As dessert was being served the musicians took a break and out came the Irish dancers. Three beautiful lasses and two sharp lads took to the stage and began a 30-minute step spectacle that would have made Michael Flatly proud. The band reappeared for a final short set and by 11pm it was time to head home. We discovered that the pub ran a free shuttle back into Dublin, one we could have taken to get here and saved the €23 cab fare had we known. We took advantage of the ride and enjoyed our driver Willie’s humorous stories on the way home. Another hearty full Irish breakfast consumed, we picked up the rental Ka and headed north. Yes, I said Ka. It’s a European Ford product about the size of a walnut. The steering wheel is on the right, so you shift with your left hand and pray with the other. I have to tip my hat to Dave. He drove most of the time and I was darn thankful for that. 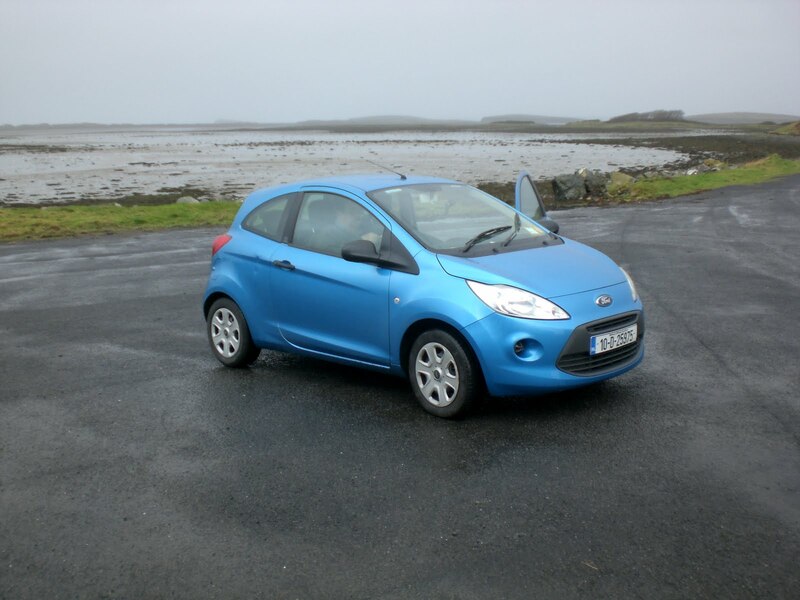 He had some experience as he had rented and driven his family around the Island a year ago. My first time staring at traffic on the wrong side of the bloody road was nerve-wracking and taking a right turn, easy as pie in America, was taking your life in your own hands here in Ireland. Oh and let me tell you about traffic circles….they are everywhere! These ’round-a-bouts’ are a technically superior idea to lights and intersections. The traffic flows, without the start-stop method we employ here. But that is not without its own issues. Like when you don’t know where the heck you are going and you’re suddenly in the circle with 10 other cars and now it’s your turn to exit but there’s a car there…yikes! I admit it got easier the more I did it but trying to reverse engineer my brain for left is good, right is bad took some time. The trip to Belfast would have many stops in between as we needed to check out several hotels for future tours and see the many stops we would include in those tours. The ride out of town was via the M1, a modern 4-lane super highway very much like what we have here in the USA. The real fun didn’t start until we ventured off the beaten path. 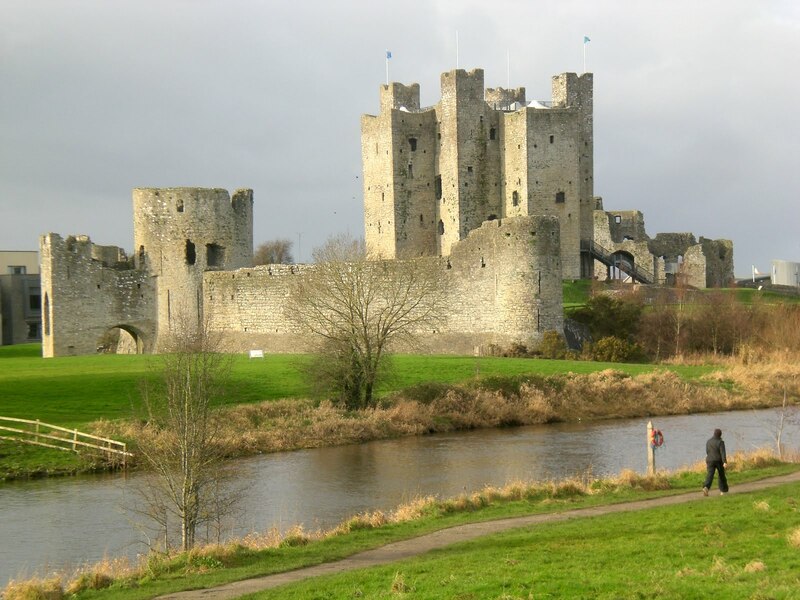 Our first stop was Trim Castle located interestingly enough in Trim, Ireland. The town had grown up around the large structure but it was still an imposing edifice and looked just what a medieval castle should look like. Time didn’t permit us to stop and tour most of the sights we were visiting. This was a whirl-wind familiarization tour meant to give me the overview. We were now off the beaten path. The roads were narrow, winding, two-lane, shoulder-less strips of macadam bordered by 4-foot high stone walls that framed the edge of the road. No room for error. Add in the wacky signs and weird pavement markings and it was truly an automotive adventure. Thank goodness we were in a Ford walnut and not an Explorer. We passed through the beautiful Boyne Valley and stopped briefly at the Hill of Tara, the ancient seat of the High Kings of Ireland. One last stop at Monasterboice provided the kind of photo-op I had imagined getting in Ireland. Surrounded by an old graveyard, the remains of two 5th century churches were magically set among lush green fields. After checking out all the sights out in the country we headed back onto the M1 and made our way towards Belfast, Northern Ireland. 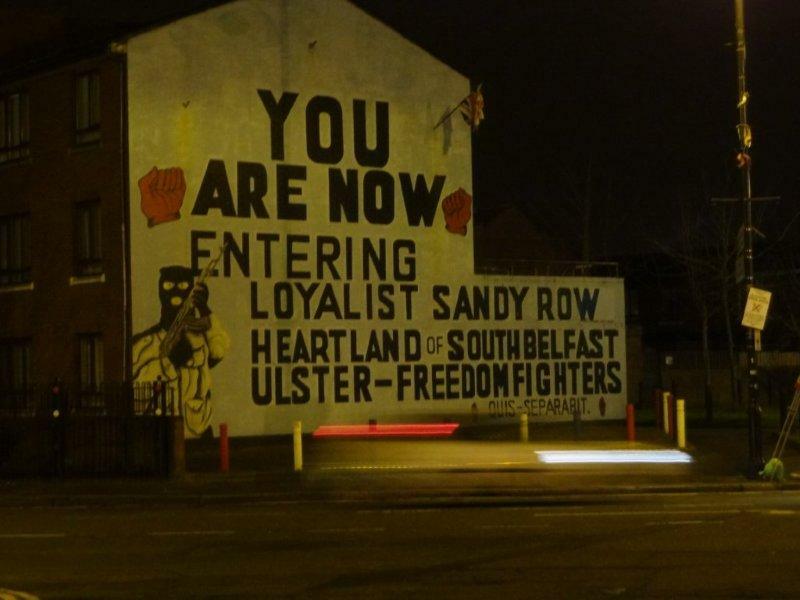 The past history of the strife or as the locals call it “the Troubles” in Northern Ireland has taken its toll tourism wise. Even though there haven’t been any confrontations between Catholics and Protestants in many years, the images of bombings and terror still prejudice many travelers. The North has suffered but now they are working hard to woo the tourist and the tourist dollar. 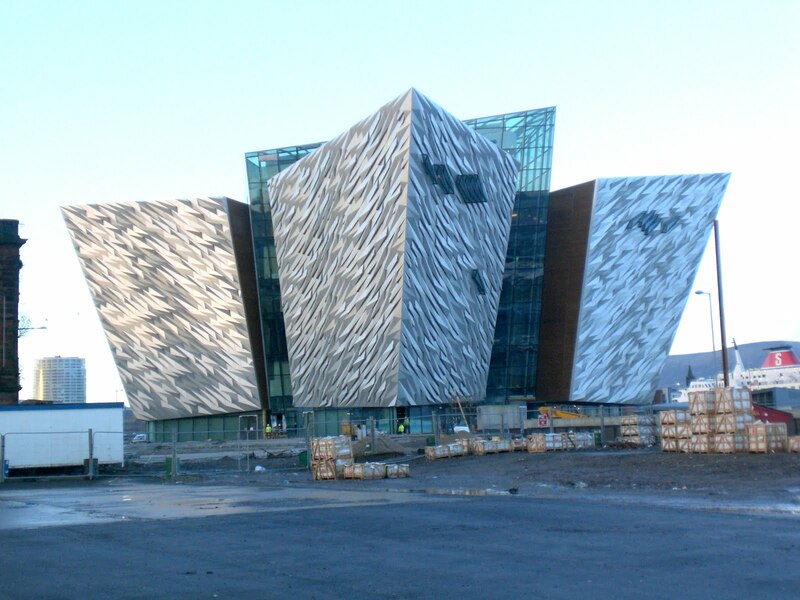 Beginning in April 2012, a new museum dedicated to the Titanic will open on the spot where the doomed ship was built in 1912. Not coincidentally it will open 100 years to the day, if the museum opens on time, of the anniversary of the sinking on April 15. 1912. We stopped by the construction site and tried to weasel ourselves inside for a look. A worker, with the heaviest Irish accent I had ever heard, informed us the interior was still a complete work site and no access was allowed. Judging by the work going on outside, I hope they make their mid-April opening. As we headed further north to the coast where the Atlantic Ocean and the Irish Sea meet the clouds seemed to dissolve into the beautiful blue sky. The ever verdant land was even more brilliant under the bright sun and the magical colors of the Emerald Isle were on full display. After a forty minute drive we arrived in Bushmill, home to that famed triple-distilled whiskey that bears the town’s name. The distillery offers tours that I would highly recommend. 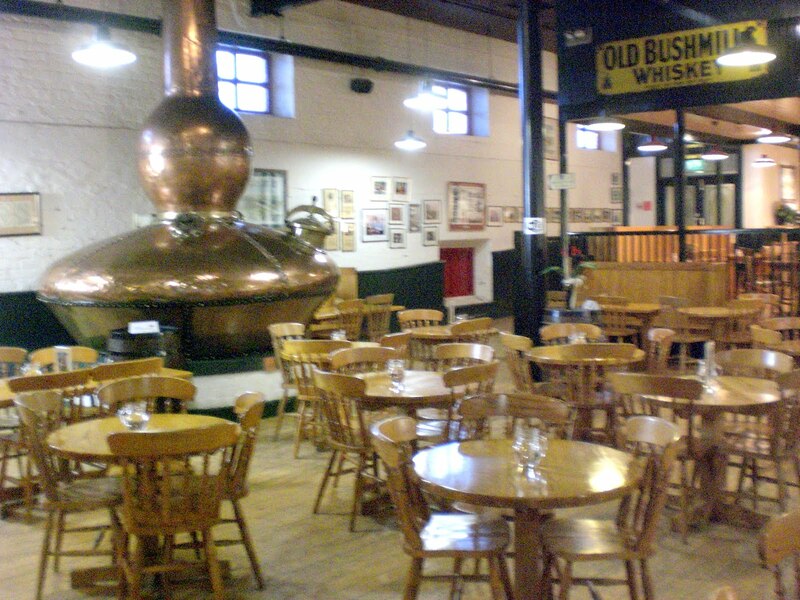 Whether you are a whiskey drinker or not, the tradition, craftsmanship and old-world charm is a must see. A sample is offered at the end of your tour but sadly no photos are allowed inside the distilling facility. From Bushmill we continued six kilometers north to literally the end of the road. There, at the top of the cliff is the Giant’s Causeway Hotel and visitor’s center. The Giant’s Causeway is a natural geologic wonder entwined in folklore that gives this spectacular rock formation its extra charm. 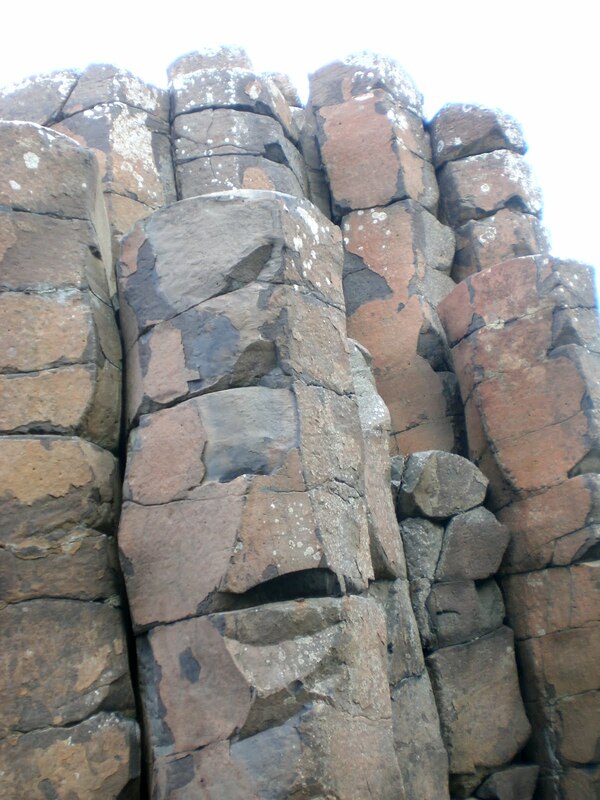 Legend has it the two giants, Finn McCool from Ireland and his Scottish counterpart Benandonner built the causeway so they could meet and fight. One version of the legend tells that Finn fell asleep before he got to Scotland. When he did not arrive, the much larger Benandonner crossed the bridge looking for him. To protect Finn, his wife Oonagh laid a blanket over him so he could pretend that he was actually their baby son. In a variation, Finn fled after seeing Benandonner’s great bulk, and asked his wife to disguise him as the baby. In both versions, when Benandonner saw the size of the ‘infant’, he assumed the alleged father, Finn, must be gigantic indeed. Therefore, Benandonner fled home in terror, ripping up the Causeway in case he was followed by Finn. 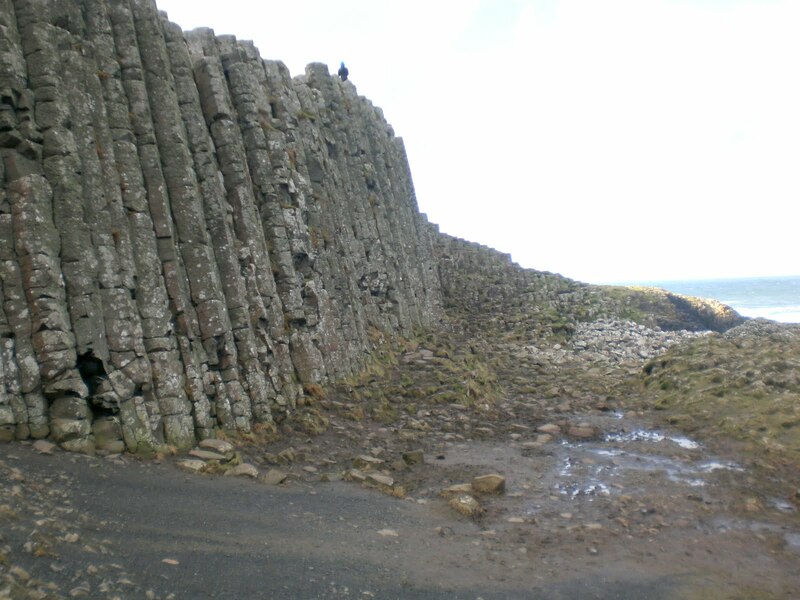 The causeway is a unique deposit of volcanic basalt that cooled in just the right way as to form hexagonal stones. These stones extend out into the sea from the cliffs thus creating the illusion of a once built causeway across the Irish Sea to Scotland. Our time at the Giant’s Causeway was done and as we headed back south as quickly as the clouds departed they returned; along with a biting wind and colder temperatures. Today was a lot of driving as we would spend the night in Westport, almost 400 kilometers away. I was glad most of it would be spent inside our warm walnut. 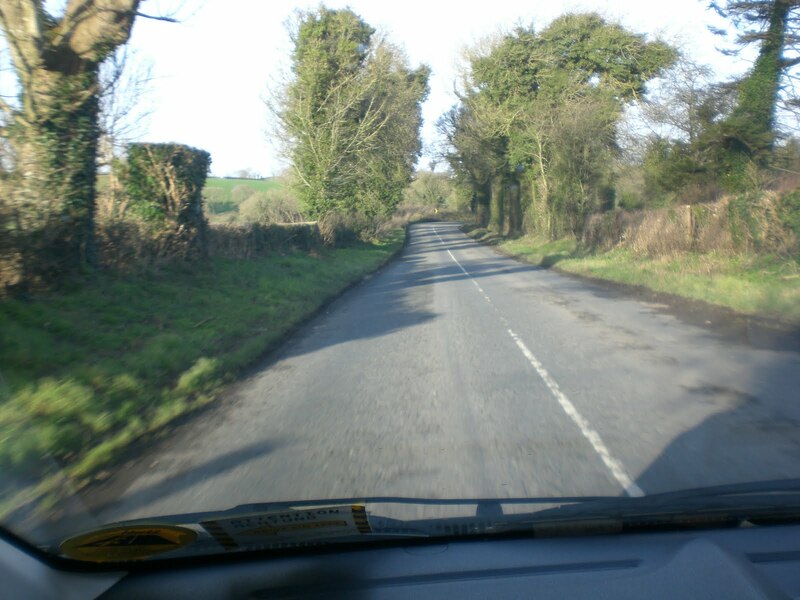 The trip took us through Coleraine, Londonderry, Letterkenny, Donegal, Sligo and County Mayo. Simply beautiful even in the gray mist and broken clouds. It was now I got my shot at driving in a world where left was right and right was wrong. Up to this point, Dave had done a swell job of driving only getting me to invoke the Lord’s name twice. We stopped for gas and after fueling the walnut with 43 liters of €1.54/ltr petrol Dave retook the reins. He said he was refreshed. I think he was scared of my driving. We continued towards Westport. We are now in county Mayo. The west of Ireland is much like the American west. More spread out, more wild, more sheep. I haven’t talked much about the sheep but they are everywhere. White, brown, black, muddy. All have some sort of spray paint marking on them denoting ownership. Yes it’s weird seeing a phosphorescent pink ‘x’ sprayed on a sheep’s side. Even though every field is enclosed with a rock wall I imagine these buggers get mixed up all the time. Thank goodness for Krylon. 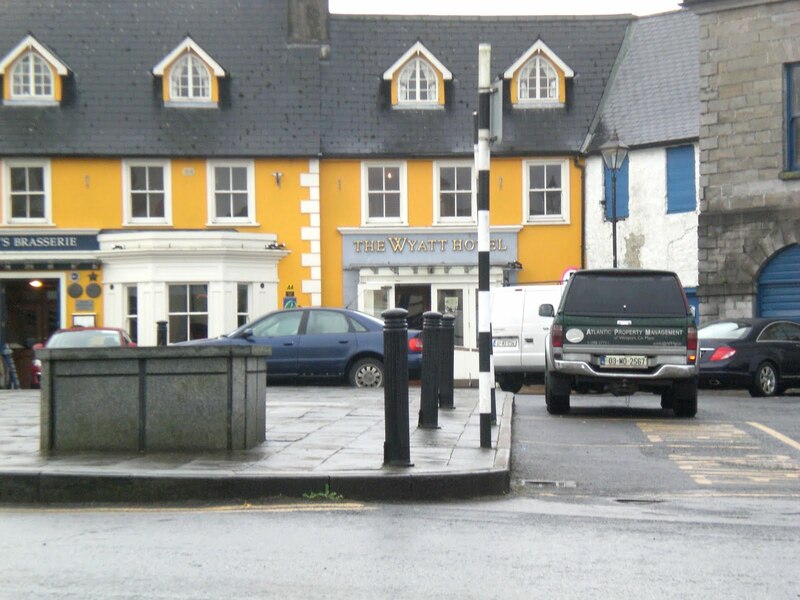 Our long day of driving ends when we arrive at the Wyatt Hotel in Westport. Our hotel is literally in the center of town on the octagon that makes up the town center. After checking in we head out looking for a restaurant following one of the spokes that emanate from the octagon. The sun has long since set and the street lamps of this port town give the wet cobblestones that movie set look. We find an Italian restaurant and proceed to have the best pizza I have ever eaten. Dave, who lived in Italy for 4 years, concurred. The next morning was wet, gray and cold. The weather was going south and as luck would have it, so were we. 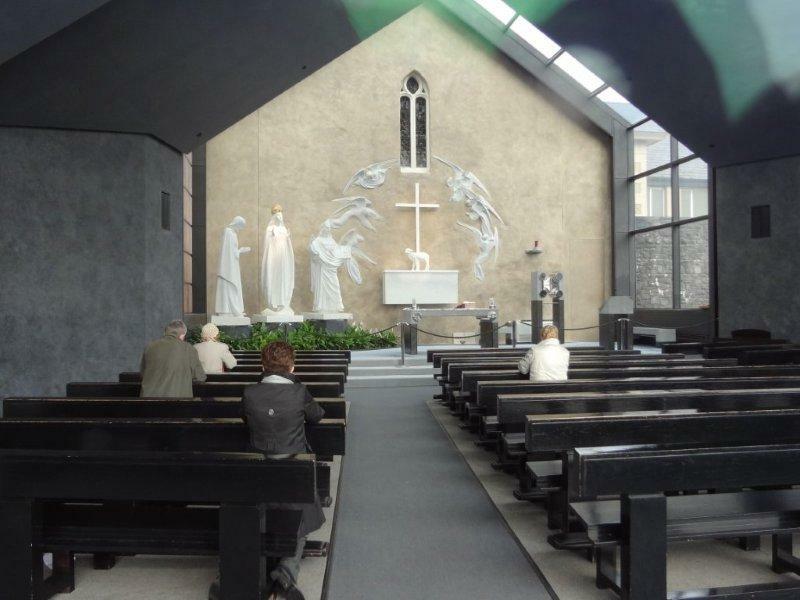 There is a must see for any tourist in Ireland and especially the faithful Catholic. The shrine at Knock is the place in 1879 where the Virgin Mary, St. Joseph and St. John appeared to more than a dozen residents. The apparition lasted several hours and included a lamb and three angels appearing at the south gable of the Knock Parish church. Pope John Paul visited the site in 1979 as did Mother Theresa in 1993. From Knock we continued south to our ultimate destination of Claregalway. We arrived again after sunset and after checking in to our hotel headed the 6 kilometers into Galway. Galway is the musical center of Ireland. 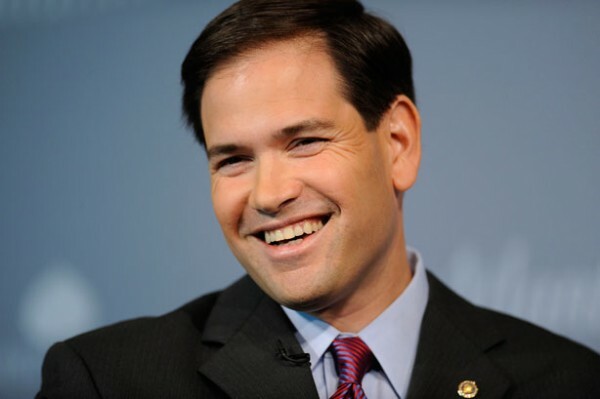 It is also one of the most youthful cities in the country. Home to a university, the city has a college town feel. Outside of Dublin, it had by far the most vibrant night life. Quay St. is where it’s at. Teeming with shops, pubs and ‘take aways’ this main drag and the streets surrounding it is a must see. We had dinner in a Fish and Chips ‘Take Away”. That’s Ireland’s version of fast food. It was delicious. 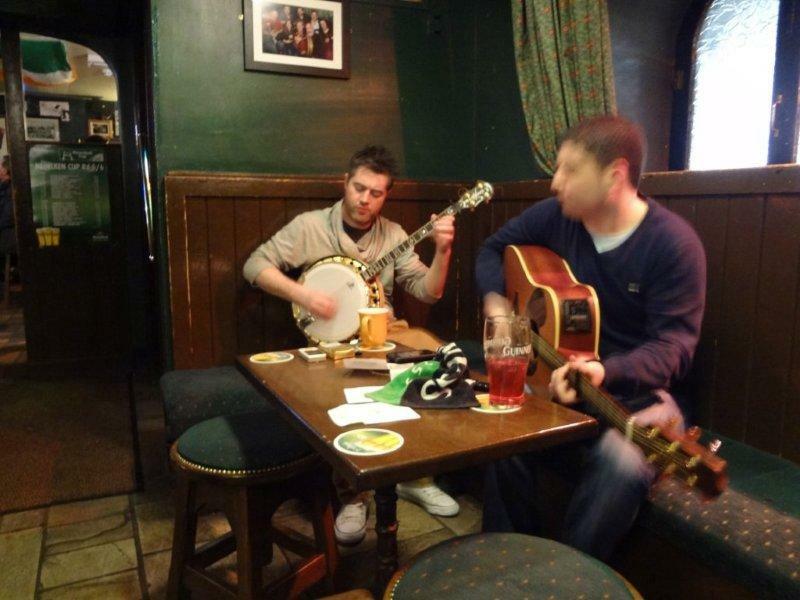 After dinner we found two musicians playing an impromptu jam session in one of the many pubs on Quay street. Tucked in a quiet corner, one played the acoustic guitar and the other the banjo. Both were excellent just playing for the crowd’s applause. Our last full day in country included the most rural driving of the trip. 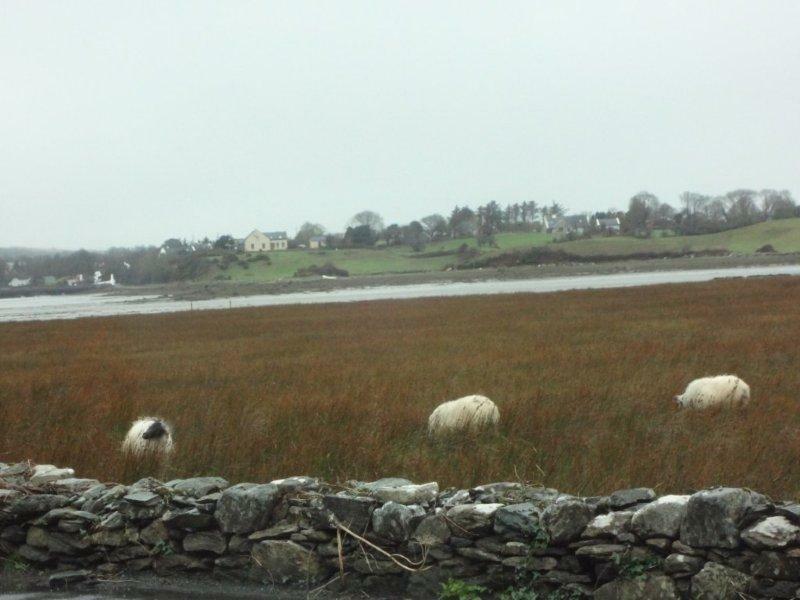 We departed Claregalway and headed to the coast through an area known as the Burren. A magnificent barren landscape that has been likened to the moon. Vast expanses of sedimentary limestone and shell cover the countryside. Its starkness is its beauty. Past the Burren the landscape changes dramatically once again as we approached the Cliffs of Moher. Mother Nature was not going to cooperate with a nice, clear day. She had decided to be extra wet and cloudy and cold. On a clear day the Cliffs of Moher are said to be one of the most spectacular sights in all of Ireland. Standing 700 feet above the Atlantic Ocean and stretching more than five miles, the cliffs are a near straightdown sheer to the shore below. On a clear day you can see the Aran Islands 15 kilometers away. Unfortunately, we saw none of that. Satisfying myself with the beautiful Tourist Bureau photo from the brochure we pressed on. 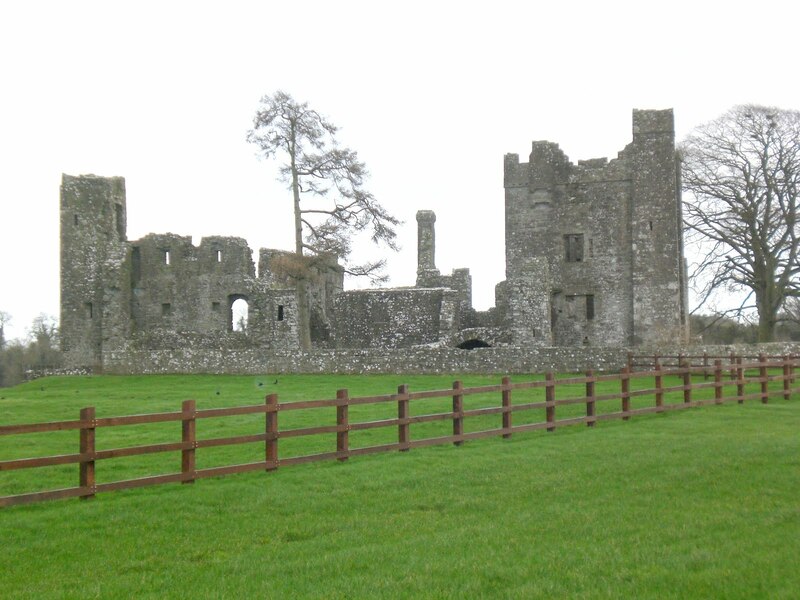 More ancient ruins, castles, sheep and death-defying roads were enjoyed before we arrived in Bunratty; home to the Bunratty castle and the famous woolen mills. It was time to buy some souvenirs. My daughter had asked for an authentic Claddagh ring before I left. As luck would have it there were Claddagh rings of every size, shape and price. The gold ones were not going to be purchased because she specifically said she wanted a sterling ring. For that I was thankful as the gold ones were 20 times the price of the silver. The wife got lucky too as I spied a necklace I thought she would like; also in silver. We finished with the shopping and decided we had had enough of the weather for the day. 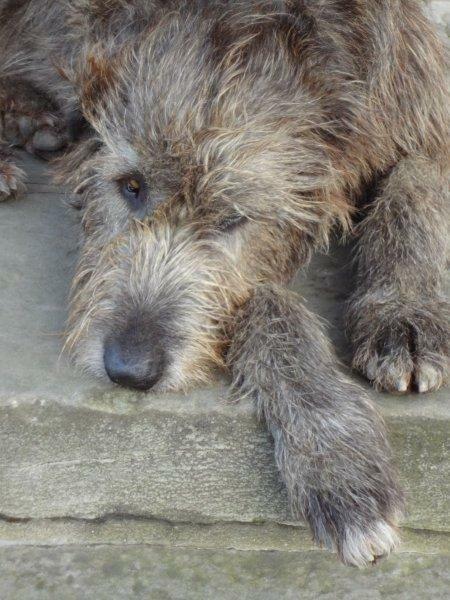 It was turning colder and we were ready to start our preparations for coming home. Prior to leaving for Ireland Dave had made a connection with a local Irish tour guide. He wanted to meet us so he could pitch himself as a local source. 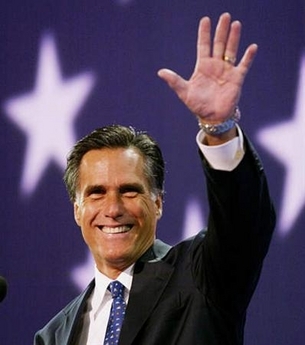 We had a loose meeting scheduled at our hotel for 5pm but didn’t really think he would show. We arrived right at 5pm and Peter Clarke was waiting for us. Peter turned out to be a really nice guy and will probably be of great value to us in future tours. Like everyone we met, the Irish welcome was always warm and sincere. There is a long list of other sites we visited I didn’t mention. 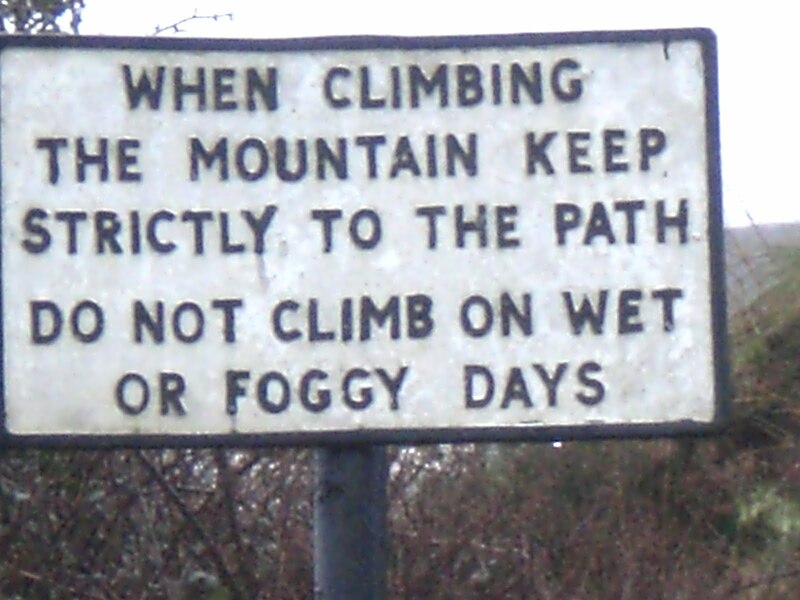 They include: Croagh Patrick—the mountain St. Patrick climbed and meditated on for 40 nights; Cabra Castle—an actual castle we stay a night in; and many other Abby’s, churches and historical sites that dot the landscape. A nightmare trip back to Florida was the only obstacle before me. The domestic leg from Newark to West Palm was delayed 5 hours. That coupled with the 7.5 hour flight from Shannon and the 5 hour layover in Newark before the delay plus the 5 hour time change made for a very long day. 24 hours in Irish time. 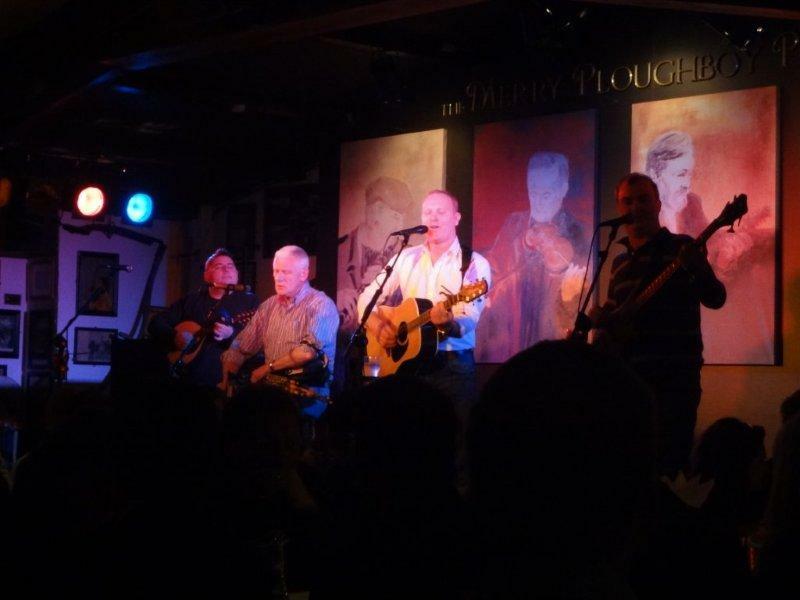 But don’t let the thought of a long flight deter you from touring Ireland. It’s worth every minute it takes to get there and back. I can’t wait to visit again. Sláinte!